I have been getting really busy and hence trying to write one article a month. Now, lets come to another important aspect which we investors look at in a business - The pledging of shares. 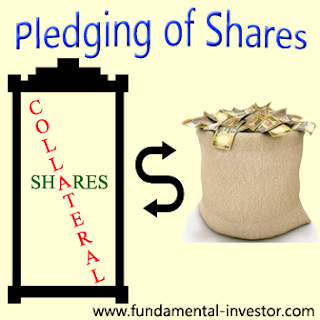 Now, what is pledging of shares? Who does it? Why is it done? What is the impact? I think you need to understand these concepts thoroughly. A promoter generally would oversee the operations of the company and is the brand ambassador of the company. He/She believes in the company and is the face of the company. The promoter's report card will certainly drive the valuations of a business. If the promoter is having an excellent track record, is honest, a visionary, investor friendly etc., the business has a good chance of getting a nice and strong, smooth valuation. Now, a promoter normally would hold a good chunk of shares (It is present in the Shareholding Pattern or SHP). A good promoter holding normally signifies the confidence of the promoter in the company. A promoter buying shares from the secondary market also is a positive sign for long term investors. As you very well know, nothing happens overnight. Now, when promoters need money, they pledge/encumber some or all of their shares with some lenders. This essentially means that their shares are given as security/collateral to the lenders in exchange of loans. Since equity is a highly liquid asset, the lenders also are in an advantage to recover the money easily (in case there is a major problem) as compared to other security. Normally promoters pledge their shares to raise money for capacity expansion, pay off debts. etc. Ideally, a high promoter pledging signifies that the cash is not utilised well and it calls for caution. Please note that, pledging doesn't mean that the lenders own the business. The ownership of the shares is still with the promoters only. Now, normally, what is the impact of promoter pledging? Firstly, it should be very clear as to why the promoters have pledged their shares. More importantly, the plan for releasing the pledged shares also needs to be clear for investors. Ideally, I do not find it wrong if a promoter pledges his shares and is slowly releasing them from pledge over quarters with higher cash flows. The problem is when there is no certainty or vision of when the shares will be released. If there is no plan, poor investors get caught in the volatility of the share price due to greed (as always). Also, you will find that the share price of highly pledged businesses will be very volatile in a falling market. This is mainly because, if the market price of the business falls, the promoter will have to pump in more assets for the loan taken and hence, there is extreme pressure on the share price and the promoters. Also, please note that if the promoter is not able to service or repay the loan on time, the lender may sell the shares in the open market to recover it. This would bring the valuations extremely low and would result in huge wealth loss for investors who didnt do their homework. Also, if the share price falls below a certain price limit, the lenders can choose to sell off the shares to recover the collateral. Today, there are some regulations for the pledging and all, but there is a large number of companies who have pledged their shares. Time to have a look at your businesses and see if there is a pledging. If yes, why? What is the plan to release them? Is the business intact? You need to know this, my friends. If not, its time to pick the phone, write emails and bug the CS/MD until you get the answers. Else, you will be sitting on a volatile stock which would be a risk. what does promoters get by pledging there own shares with lenders for the benefit of company? Can you elaborate the case of BEPL, where the promoters pledged their shares, but they are buying from open market. Why do they buy from open market, when they have cash to un-pledge? Hi FI, appreciate your patience in trying to explain in simple words to make common Man understand the complexity of investing in market can you please tell where we can get information relating to pledge of share by different company and also matters relating to debt and liabilities.